Directions: You'll need a car and a GPS to get here! Dungeness is a headland on the coast of Kent in England. 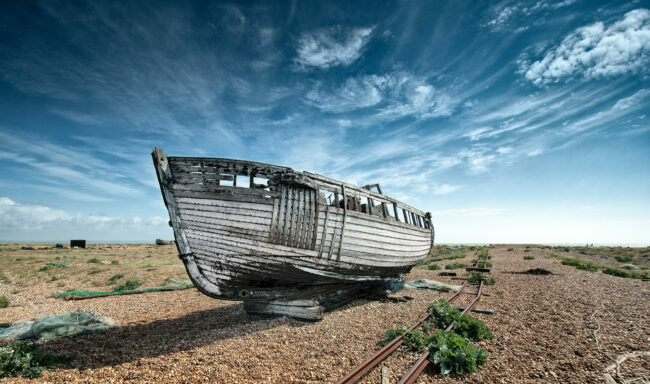 The beach of Dungeness is littered with abandoned fishing boats that have rotten over the years, leaving some interesting relics which cry out to be photographed. Dungeness is classified as Britain’s only desert by the Met Office, so you know it’s going to be some interesting terrain! The beach is a combination of shingle and pebbles, so you’ll need some decent footwear. The area is quite exposed, so it pays to take some warm clothes, just in case. The best place to park in on the private stretch of road that runs along the beach. As long as you pull off the road onto the side nobody minds you doing it. There’s a cafe and pub near the lighthouse, so you don’t have to worry about taking any food along.